Sheriff of Mendocino County, Calif., Allman has developed an innovative -- and controversial -- program to regulate the growing of legal medical marijuana while continuing to eradicate illegal plants. This is an edited transcript drawn from two interviews conducted on Oct. 18, 2010 and March 7, 2011. So first I want to talk about the regulations that you're working on for medical marijuana in the county. Tell me kind of roughly what those regulations are. We have two types of medical marijuana grows. We have the individuals, medical marijuana patients. It's dependent upon a doctor to recommend how many plants, and ... the person can follow that recommendation up to having 25 plants on any taxable parcel. If you have a 5-acre parcel and your doctor says you can have 25 plants, you can have 25 plants. If you have a 180-acre parcel and your doctor says you can have 50 plants, you can have 25 plants, because 25 is a maximum pretaxable parcel. And the reason for that is we realize there had to be some type of limit on the amount of marijuana being grown. Otherwise it was going to be grown from property line to property line. And it was causing great public safety issues, whether it was crime, whether it was the smell, whether it was just the calls for service that our 911 center was getting. So what the Board of Supervisors did was pass an ordinance last year that basically said 25 plants per parcel; there has to be at least a 6-foot fence with a lockable gate around it. And that's for the medical marijuana patient, the individual patient. What the cooperative is in Mendocino County is, if you have at least four patients that can grow 25 plants per patient and you have a 5-acre parcel and you have a 6-foot fence with a lockable gate and you can prove to the sheriff's office that you're not stealing or illegally diverting water or electricity, and that with the marijuana that's being cultivated it is not going to be visible from any public highway or street or road, then you're going to be able to form a cooperative that works with the sheriff's office on the medical grow. The very first thing you have to do is you have to fill out an application -- I believe it's seven pages -- to the sheriff's office that states who you are, where you're going to be doing your cooperative, who are the other patients, provide copies of their doctors' recommendations. And then this would be given to the sheriff's office along with payment of $1,050. That money is for us to be able to assign a deputy sheriff or a sergeant to investigate this cooperative to say is everything on the up-and-up here. You know, is it people from Los Angeles who just want to come up here and do whatever, or does it actually involve local people that are trying to be within the boundaries of the law? And so once that application is approved, then the applicant is allowed to come in here and buy up to 99 of the plastic zip ties that have serial numbers on them that designate it as a legitimate medical marijuana plant. He can buy up to 99 of those at $25 apiece. Once he or she has those, then they go and they place them on their marijuana plants. And in theory, that's the process to become a cooperative, but then the additional is they have to pay to have the sheriff's office or a representative show up at their house once a month and inspect. And when I say inspect, [I mean] make sure that they're still growing within the boundaries, that they're still not illegally diverting water or electricity, that the plants are not visible from the highway or road -- all the rules that we started with. What the monthly inspection is for is to make sure they're still complying, so that's an extra $600, $700 a month for these people. Tell me more about the tagging. Is this unique? Are there any other counties doing the tagging program that you started up? Now, have there been people who have misused the zip-tie process? Well, of course, and one of the things that we ask for our deputy sheriffs to do is use common sense and make sure that people aren't trying to counterfeit zip ties or to work outside of the boundaries of law, because we're trying to make the law work as the law has been passed by the voters and the courts have interpreted the law. If law enforcement continues to ignore what the voters' intention was, and if law enforcement continues to ignore what the courts have mandated, then law enforcement is going to find itself on the losing end of a battle. And I don't want to be the first sheriff who writes a check to somebody for cutting down legitimate medical marijuana from a patient or caregiver. I want to do everything I can to allow that person the comfort to say, "Well, if I'm not here at the house, if I have to go downtown for a gallon of milk and the cops come and go in my backyard and they see my zip ties, they're not going to cut down my medical marijuana plants; they're going to get in their car, and they're going to drive away." So that's what this represents. It's been very successful. When I say successful, I'm not talking about just the financial aspect of it. I'm talking about the trust and the relationship being built between the medical marijuana community and law enforcement. We're not the only law enforcement game in this county. We have three city police departments. We have the State Department of Justice. We have the DEA [Drug Enforcement Administration]. We have the FBI. We have all these other entities that one way or the other have some kind of legal reason to come to our county and investigate. And at this point, with only one or two exceptions, I think these other entities have acknowledged what we're trying to do to make it work. So that's where we are. Can you tell me about the financial success of the zip-tie program? So in 2009 we started selling, and we did right at $35,000 worth of zip ties. Now, I know in the whole scheme of things, if you look at the amount of marijuana plants we have in this county and the number of zip ties that we sold, you would say, well, that's just a drop in the bucket. And I would say you're right. [What are] your expectations for the zip-tie program in 2011? In 2011 we expect to utilize the zip-tie program to bring in probably a quarter-million dollars for the county. And when I say a quarter-million dollars, I'm not just talking about for the sheriff's office. Whether it's through planning and building and getting houses approved through the planning and building permit and licensing, whether it's requiring people to pay the government to certify scales that are going to be used for weighing, that's happening right now. We're trying to make sure that the business requirements for other businesses are the same business requirements for medical marijuana businesses. So it's working. Last year I used $5,000 from our drug asset seizure account and took out a half-page ad in all seven local newspapers to say, "This represents the law that we're going to enforce in Mendocino County this year," and it helped a lot of people. It helped, number one, the medical marijuana patients. It helped the anti-marijuana people say: "Well, OK. If that's what the law is, I guess in October I'll plug my nose when my backyard smells like a skunk and just get over it." And also it helped law enforcement come to a consistent understanding of what the law is. So it's a tactic that I would truly suggest to others who are faced with the same thing that we're faced with of confusing, convoluted, ambiguous laws and put it in black and white, because how can we as law enforcement expect a citizen to follow the law if no one has really and truly told the citizen what the law is? Ignorance cannot be an excuse. The courts have said that. But I think we're getting close to ignorance being an excuse if so many different laws are being interpreted in so many different ways. ... What sort of pressures are on your department having to [do] both [eradication and the zip-tie program]? But one of the big questions is going to be, well, will the federal government continue to give money to a county that is trying to work with medical marijuana patients, or are they going to say: "No, stop it. We don't allow that, so you're not going to get the federal funds"? So one of the big questions is how does the federal government view this. And to that I would welcome anybody from the federal government to come here and to explain to me what their expectations are, because I do want to explain to them why we're doing what we're doing. We're not a bunch of Cheech and Chong law enforcement officers that are encouraging people to grow marijuana. Nothing could be farther from the truth. I think what you're seeing is you're seeing law enforcement working with the citizens to say: "OK, we think we understand the problem. We think we have a solution. Let's give it a try." And fortunately, because we have so many forward-thinking citizens that say, "All right, well, let's try it," if it works, it works, and if it doesn't, it doesn't. I'm not married to any idea. Let's just get over this so we can focus on domestic violence; we can focus on methamphetamine; we can focus on burglaries; we can focus on school absences. All these issues come into any society's problems, and they're absolutely part of our social fabric. But until we get marijuana off the front page, medical marijuana off the front page, we don't have the time to work with the domestic violence and the meth and the burglaries and the school absences and so forth. So we're just trying to make the best [use] of our time. Do you have any concern that this tagging system is literally like a red flag to the DEA? I mean, all they really have to do, right, is find somebody who's got all these yellow tags, because under federal law, even medical marijuana grows are illegal. When I first became sheriff, I met with the assistant U.S. attorney out of San Francisco. His name was Joseph Russoniello, and he came into my office. We had a great conversation at that table over there, and I explained to him what we're trying to do, and he gave me a handshake deal that as long as we're trying to abide by the law and as long as we're trying to work with the constraints that the courts and the state Legislature and the voters have given to us that the federal government was not going to come in here and go for our medical marijuana people. Now, have there been medical marijuana patients who have had their medical marijuana seized by the federal government and have been arrested? Yes, there have. And those situations ... are rare, but they have happened. Those situations always involved some kind of outside information from a different part of the state where a much bigger operation has been identified by the federal government, and the local person here is merely a pawn in this larger marijuana operation. So growing is legal, but other parts of the process remain very much in the gray area. What is Mendocino County's attitude about transportation, I guess, is the first question, so to speak? To say that Proposition 215 is living, breathing, is an understatement, because we're just now getting to the point where law enforcement is accepting part of it, and so now let's talk about transportation. One of the ideas we've had, just like we have serial numbers on zip ties, we may have serial numbers and expiration dates on plastic bags. ... People aren't going to be able to use it over and over and over. The plastic bag would have a serial number and say this plastic bag can be good until, you know, June 30, 2011, and that way if an officer found it on July 1, he'd say, well, this Ziploc bag is expired, and it's not good. It seems to be a pretty well-known fact that there's marijuana being grown on state and federal parks, national parks. What's the scale of the problem, and have you seen that problem increase over the years? In Northern California we have a lot of national forests, state lands and county parks, and we've seen an explosion of non-local citizens and illegal aliens coming into our national forests and growing marijuana for six months. They arrive in April, middle of April, and they stay in the national forest until the middle of October, and then they harvest their finished product, and they carry it out. And so what they have is they have people who are financing them that at the end of the season will pay them a $10,000 or $15,000 lump sum for them to have grown marijuana all summer. And we also have the same financiers transporting supplies, food and personal toiletries and so forth to them once a month and dropping it off. And so what we're seeing in the national forest is we're seeing huge marijuana grows -- huge. I'm talking 500- and 2,000-plant grows by four people in the national forest. And our national forest is huge. It's 915,000 acres. And there's six counties that surround the Mendocino National Forest. There's Tehama County, Trinity County, Glenn County, Colusa County, Lake County and Mendocino County. And in the past what's happened is it's almost like a pingpong game. The counties go in and eradicate marijuana up to their county border, you know, knock the pingpong ball over to the other county line, and we think that we've solved the problem. Well, we're doing nothing but facilitating the problem. We're allowing the problem to continue to be a burden to us. So in August 2010, last year, the Board of Supervisors, my Board of Supervisors, met in a very remote area of our county called Covelo, and they were addressing the marijuana issues. And I believe there were 11 citizens who stood up to talk to the Board of Supervisors at the beginning of the meeting, and the first four citizens who stood up to talk to the Board of Supervisors said, "Last year I was shot at in the Mendocino National Forest." Well, this is staggering, you know. I've been a cop 28 years; I probably can count on one hand the number of cops who have been shot at, let alone the number of citizens who have been shot at. So the Board of Supervisors took this very seriously, and they said, "All right, sheriff, what are you going to do about it?" We're planning a very large operation in the Mendocino National Forest for 2011, and it's going to be a program that is going to not go just to the county line and deal with each county. All six counties are going to be working with each other. ... It's going to be very expensive, in the area of $1.5 million. That being said, I would ask anybody who says it's too much money, I would say, what is a national forest worth? Because if people aren't allowed to use it, if they're too afraid to use it, it's worth nothing to us; it's nothing but a crime zone. It would be the largest crime zone in Northern California. Can you show us some of the areas that you're talking about? Mendocino National Forest is huge, 915,000 acres. And so what our operation is going to be is, with Mendocino County over here on the west and we're working with Trinity County to the north and Tehama and Colusa and Glenn and Lake County, we're really and truly going to focus on the public lands. One of the problems are going to be the dark green areas that you see, the wilderness area. These have been designated wilderness areas, which legally mean you can't bring a mechanized vehicle, a truck, a QuadRunner [ATV], any type of vehicle -- you couldn't even bring a helicopter in to help sling out all of the marijuana. What we've done in the past is we've worked with a couple organizations that have pack mules, and we're actually going to be hiring pack mules to go in with our officers and our volunteers to pack the garbage out. A lot of this marijuana we're not going to pack out. We're going to, in the nonwilderness area, we're going to hopefully just take a chipper in. We're going to chip the marijuana and just dispose it and throw it out in the woods and let it disintegrate and decompose. So it's expensive. It's a very expensive operation. However, if we don't do it next year, I'm going to tell you it's not going to be done. Well, one of the reasons it's not going to be done is because everybody has said this is somebody else's problem. And as long as government says we only own part of the problem, then government's not going to accept the whole problem. And I'm telling you this is everybody's problem. And the federal government, they don't have the staffing to go in and take care of what needs to be done. But they do have access to some of the resources, the money. Local agencies, we have the staffing, but we don't have the resources. There [are] several things we are keeping close to our chest. We are not talking about strategy or tactics, and I am not referring to the dates of the operation [to] anybody. But as far as the operation, I feel it's very important that we notify the public that we are doing it, and this is for several reasons. Probably the biggest reason is to let Joe the taxpayer know that we are concerned about the public lands. I've had people come to me and say, "My family has hunted in the Mendocino National Forest for five generations, and we don't go there anymore because every time we go there, we hear shots being fired around, or people have literally walked into our hunting camps and said, 'Get out of here.'" So we really, truly want [to tell] the public ... to understand we are organizing our efforts, not just as Mendocino County, but we're trying to be very unified in this and letting [them] know what's happening. The second thing is, let's say that the press that we're getting on this reduces a number of gardens in the Mendocino National Forest by 10 percent this year. Well, it now means that 10 percent of our effort is going to be spent on other gardens. We're not going to take care of it all one year, but it's going to be a three-year operation. But every little bit counts. Let me ask you something. We spoke to a man today, Mexican; he's been a small-scale grower, and he told us he is not growing anymore. ... He said one big reason is the new people who have come in the last year don't play by the same rules. They've got a lot of guns, and he's got a young daughter, and he doesn't want to be anywhere near that kind of a scene. ... Does that square with what you are aware of? Hispanics in our community have been welcomed since I have been a little kid here, and they are a very important part of our community. Early last year I received information from the DEA regarding that type of individual that we're talking about. ... [They] said, "Your county is going to be the recipient of this type of grower," so I obviously became very concerned. I think it's very important to make sure our flag is in the sand to say: "This is our territory. We're not going to give it up, but we're at a critical turning point. We are at a fork in the road, and if we don't make an aggressive push right now to take back some of our public lands, then we may get to the point of no return." Do you sometimes feel that way that you are walking on this very narrow line between the program to license medical growers and on the other hand about really trying to mobilize this effort to stop this other kind -- I mean, it's a very curious position if no one else in California is in this position that you are. Growers tell us that really 80 percent, 90 percent of the marijuana being grown is not legal. They are not growing within the limits, and they are not selling it to dispensaries; that there is a lot of phony baloney. That goes along right with my statistics, and I use the phrase it's a single-digit percentage of people who are growing marijuana that are truly getting the marijuana for use in a medical field, medical purpose. OK, that's perfect. There is nothing wrong with asking law enforcement to focus on the people who are abusing laws. I mean, that's what we do for a living, except the slippery slope always allows people to go to the lowest common denominator, and that's where we are. As far as people say it's not going to work, you know what? Prove me wrong. Listen, the world is not going to end in 2011, and at the end of the year, someone is going to be proven wrong, either me or the skeptics. I am ready for that day. I will ask them a question, and I have asked this question: How many drug cartels are too many for a county to have? What's the answer? One, two, 10? Because this county meets all three of those numbers absolutely, and with what the public is going to see this summer with the Operation Full Court Press, they're going to see things the law enforcement has been hearing about in the intelligence circle for years. And I think that what some people aren't aware of is the absolute truth that cartels have said public lands are going unchecked; public lands have water; public lands are isolated; we won't get caught, here is proof. They've been doing it for years, but this may be the year they put their "Closed" sign up, at least in our county. When you say cartels, you are talking about groups in Mexico that are responsible for some of this horrific violence we see? I am talking about organized crime. Organized crime is a group of people who get together to conspire to commit a crime. And right now, am I able to absolutely identify one cartel who has a cartel member in Mendocino County growing? The answer is no. However, there is a lot of intelligence out there that I haven't been briefed. It's not my concern if a person growing marijuana in the Mendocino National Forest is a cartel member or not, but it is a concern of the prosecution, and it is the concern of public safety. I mean, my job -- when I say it's not my concern, I am not saying I don't care about it. What I am saying is I am not going to make my enforcement actions based on a cartel member or not. But after the summer, when some of these main players end up in the paper and on TV, and this is who this person is, I think some of those naysayers are going to say, "I had no idea." Because you think this operation will lead to arrest not just of the low-level growers but others. That's what you are suggesting? Just to be clear that part of that strategy is to make arrests and prosecute cases, don't let people get away like they have over the years, you want to make arrests and prosecute people? Otherwise they are just going to come back next year? Yes. You are right. And my life isn't rewinding last year and playing this year; it's not how I go through life. 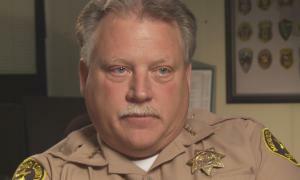 Even those all-time deputies who say, "Gosh, why is sheriff doing this? Why is our boss allowing marijuana to be growing with tags or something?," would agree that we have not been winning any kind of strategy against marijuana. I am not calling the warrant drugs; I am not calling [it] that. Any strategy that we have been using -- and I have been in this business for a long time -- it has to work. So why not go with what does work: good investigations, getting people in court, prosecuting them and saying to the rest of the world, "If you do this, this will happen to you"? That's probably why we haven't had a bank robbery here for a week. People know if you rob a bank, you can go to federal prison for a long time. We're saying if you grow [marijuana] on federal property, you are going to go to federal prison for a long time. And to do that, you have to have the capability to make this arrest; that is, to grab this, you have to have these tactics to be able to get in there and grab these people and get these people who are in the forest?